Life at 7000 feet: Inspired. Got a few links to share with you guys today. Links to things that inspire me or are too good not to share! My real-life friend, Angie, made these ADORABLE and (very inexpensive!) 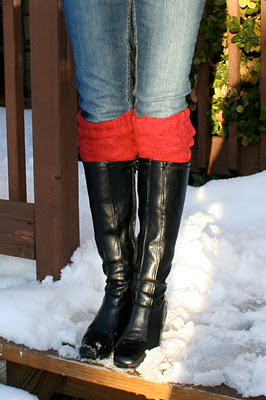 leg warmers to wear with boots. Sarah and I want to try making some this weekend! If you only click on one link in this post make it THIS one! We also hope to make some of these rice-heat bags. I bought one a few weeks ago and I use it daily because it's been so stinkin' cold here! The one I have is wonderful. This feta dip is sooooo good and sooooo easy. Make it! Seriously! I made a small bowl of it for lunch yesterday. I ate it with some leftover pita chips we had because I didn't that kind of bread on hand. Pita chips aren't gluten-free but I've found I can tolerate small amounts of wheat once or twice a week. It's just the everyday consumption that really affects me. Another friend directed me to this blog last week and I LOVE it. She has some really great gluten-free recipes and I made these steak tacos with cilantro lime rice one night this week and they were delicious! My family gave them two thumbs up. These chewy gingerbread bars are not gluten-free but they look wonderful! Maybe I'll find some time to bake soon because these are definitely on my list! Raise your hand if you're glad it's FRIDAY!!!! Yep, me too! Have a great weekend, people! Thanks for posting up your inspired links...I'm going to have to make those bars to! I'm actually hosting Bible Study this week and that would be AWESOME to have! I also think making those instead of a cookie exchange for church would be a great diversity. :) Those leg warmers are SO cute! raising my hand for friday!! yeah!